What is so intriguing about this curry is that it contains guajillo chiles, which are used in Mexican cooking. They are the chiles that are the basis of enchilada sauce. Do you suppose a Thai tourist in Mexico picked up some guajillo chiles, took them back to Thailand and was trying to figure out some way to use them, and consequently they ended up in the curry paste. I am not complaining, believe me. The flavor is amazing. This is my platter with all the toppings. I served this wonderful soup at a small dinner party and they loved it. We ate with chopsticks and Asian soup spoons, which added some hilarity to the evening. I made the soup the day before and reheated it to serve. The noodles, which I bought at the 99 Ranch Market, are really handy because you cook them, drain, run under cold water and hold at room temperature in the pan. The soup is complex with coconut milk, guajilo chiles, shallots, garlic, fresh ginger, cilantro stems and ground coriander, turmeric and curry powder. Before serving, fish sauce and palm sugar are added. 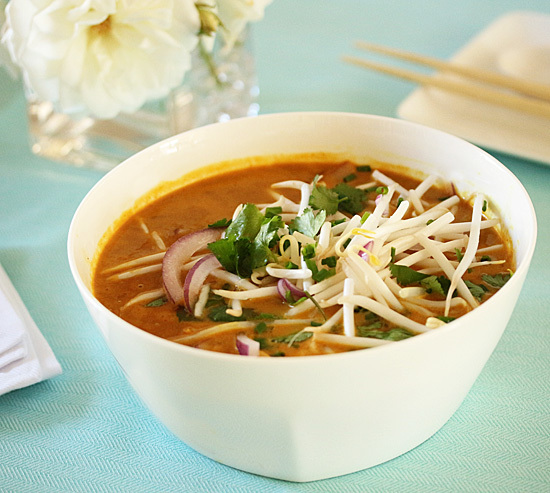 If you are a Thai food lover like me, this soup will truly satisfy. 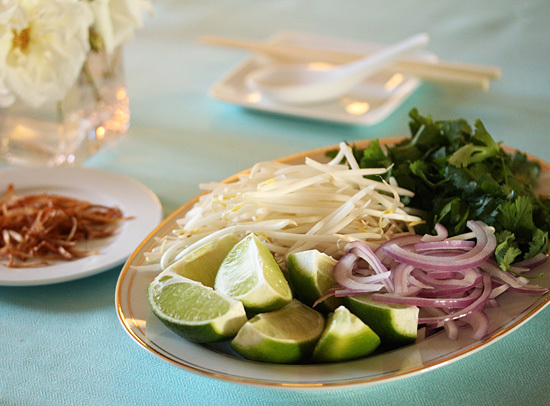 Sliced red onion, bean sprouts, cilantro sprigs, crispy fried onions or shallots, chili oil, lime wedges (for serving). Place vegetables on serving platter and cover with damp paper towel until needed. 1. Break chilis into big pieces and, in a small bowl, cover with boiling water. Soak 25-30 minutes until softened. 2. Pour chilis into strainer over small bowl, reserving soaking liquid. In a small food processor, puree chilies, shallots, garlic, ginger, cilantro stems, coriander, turmeric, curry powder and 4 tablespoons soaking liquid. Process into smooth paste, adding more soaking liquid if necessary to achieve paste consistency. 1. Heat oil in a large heavy pot or wok over medium heat. Add curry paste and cook, over medium heat, stirring constantly for 4-6 minutes until slightly darkened. 2. Add coconut milk and chicken broth, and bring to a boil. Add chicken pieces, reduce heat and simmer until chicken is cooked through, 10-15 minutes. 3. Cook noodles according to package directions. 4. Add 3-4 tablespoons fish sauce and sugar to soup. Divide soup and noodles among bowls and serve with toppings. That looks stunning! I must try this. 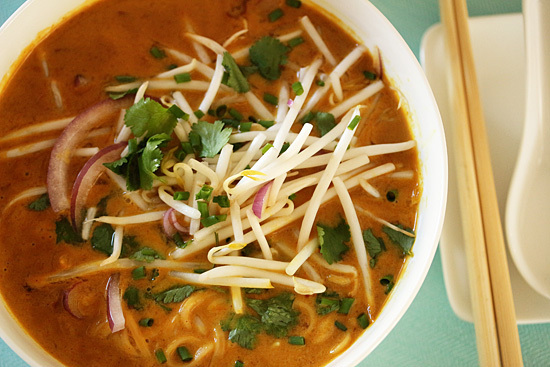 I love thai food, I will have to keep this soup in mind. I also love spicy things when I have a cold, so I’ve had sooo much spicy soup this winter! Do you know Denise of Newf in My Soup?! She also cooked this, and she called her post “Cooking the Cover.” It’s also on my list of recipes to try. Perhaps we should all get together and start a “Cook the Cover” group. This soup was so excellent. I was there when Lynne took this photograph and I’ve been craving this soup for the past month. I finally printed the recipe and am going to make it. Thanks Lynne.